A Cascading Style Sheet (CSS) is a cascading sheet of style markup that controls the appearance of content on a website. Every single WordPress theme you use in your blog uses CSS. The CSS provides style and design flair to the template tags in your templates. The CSS for your WordPress theme is pulled in through the Header template (header.php) and is named style.css. Don’t tweak the line of code that pulls in the style.css file; otherwise, the CSS won’t work for your blog. With CSS, you can provide style (such as size, color, and placement) to the display of elements on your blog (such as text links, header images, font size and colors, paragraph margins, and line spacing). CSS selectors contain names, properties, and values to define which HTML elements in the templates you will style with CSS. CSS selectors are used to declare (or select) which part of the markup the style applies to. Here are some examples of CSS selectors and their use. The background color on all pages is white. The color of the fonts used in all paragraphs is black. A font surrounded by the <h1>..</h1> HTML tags is bold. All text links appear in red. #content: One type of CSS selector. The hash mark (#) indicates that it’s a CSS ID. .singular: Another type of CSS selector. The period (.) indicates that it’s a CSS class. 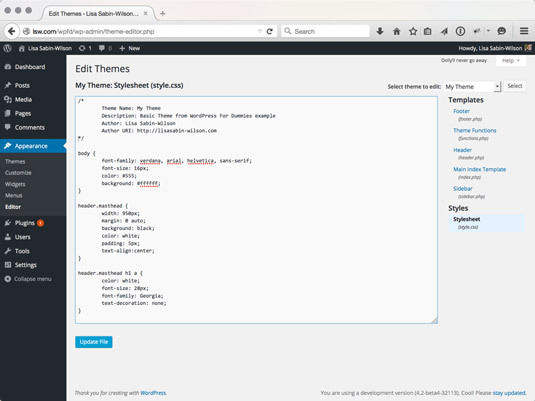 A WordPress theme stylesheet (style.css). IDs and classes define styling properties for different sections of your WordPress theme. This list shows examples of IDs and classes from the header.php template in the Twenty Fifteen WordPress theme. Armed with this information, you’ll know where to look in the stylesheet when you want to change the styling for a particular area of your theme. <div id=“page”> #page Styles the elements for the page ID in your template(s). If you find an element in the template code that says id (such as div id= or p id=), look for the hash symbol in the stylesheet. If you find an element in the template code that says class (such as div class= or p class=), look for the period in the stylesheet followed by the selector name.